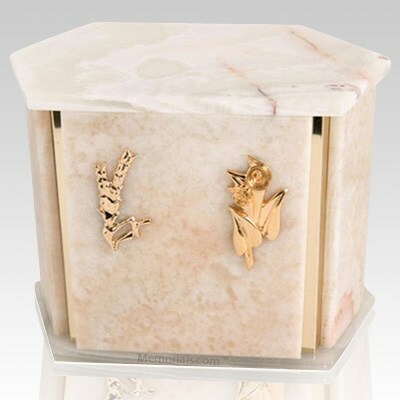 The Hexagon Mink Onyx Marble Companion Urn is assembled from real natural quarried stone (Mink Onyx Marble). The urn has 24k gold plated decoration option and the bottom has felt to protect the surface were the urn stands. A wonderful natural stone urn for two people. "It's a beautiful website. The prices are affordable with a wide variety to choose from. I must say that when I placed my order last Sunday afternoon, I discovered that I had made a grammatical error while typing a signature for the easel. As soon as I e-mailed for someone to help correct it, one of your representatives quickly, professionally, and pleasantly answered my e-mail with the error corrected. Delivery of both the urn, and easel was amazingly fast. I am extremely pleased with my purchase, and although I hope to not have to order from you for a long while (no offense). I know that I have a company that I can trust, and feel comfortable ordering from. Thank you so very much. "